One of my favorite sensations is the hot bite of wasabi tingling my nose and making my eyes smart and water. The savory horseradish taste under the shot of intense spice is wonderful. Of course, it’s best paired with sushi and friends. I spent a magical evening recently full of all these things. My friend Shirea, who emigrated from Japan about 12 years ago, graciously agreed to teach me the tips and tricks of sushi and miso soup (which I’ll post soon). I’ve made my own sushi before, but hers knocked my socks off. I devoured the succulent rolls of creamy, sticky rice wrapped in thin, crispy nori and stuffed with thinly sliced vegetables, strips of cooked eggs, and the most amazing smoked salmon. First, though, I got a tutorial in Japanese ingredients and a sneak peak at some of Shirea’s cool kitchen gadgets, including a small, rectangular frying pan which she uses to make a savory egg roll up (using chopsticks, instead of a spatula), and a beautiful wooden bowl she uses for sushi rice. As she cooked, Shirea shared bits and pieces of her decision to come to the U.S., some of her favorite things about Japan, and a few of the things she misses most (the availability and variety of seafood, for one). Her husband, who grew up here in the Northwest, told me some tales of eating in Japan, including the time he sampled raw liver. I think that might be a little too daring for me, but I could definitely live off the dishes Shirea cooked for me. 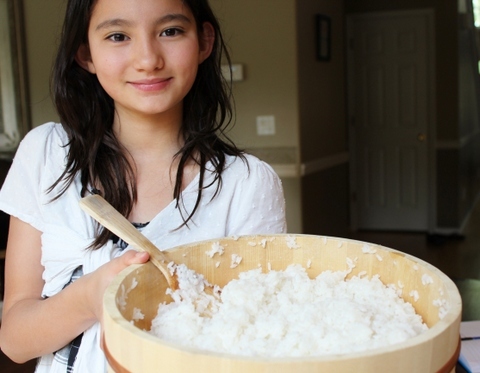 Shirea’s daughter helped prepare the rice and nicely posed for me with the finished product. A few notes before I get started. Like most of the cooks I profile, Shirea doesn’t measure. Together, we tried to estimate amounts, but in the end, I think there’s a lot of leeway with this recipe, and it should be made largely to taste. Also, the ingredients themselves are pretty open to interpretation. Feel free to omit the egg and smoked salmon, or use another kind of fish. Shirea told me many people in Japan use canned tuna or shrimp. She uses salmon caught on the Rogue River by her father-in-law, who then smokes and cans the fish himself. 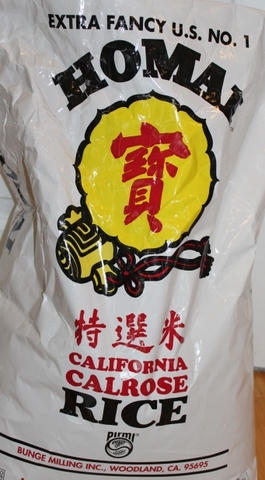 You can’t buy that kind of ingredient in the store, of course, but you can find many good smoked salmon products. In the past, I’ve used macadamia nuts in my sushi and/or thinly sliced carrot; I doubt that’s very authentic, but I like the crispy texture they add. Shirea uses the aforementioned (and now highly-coveted-by-me) rectangular skillet to prepare the eggs; however, you could use any normal, round frying pan, as long as it’s fairly small. Perhaps the best thing about my visit with Shirea (other than stuffing my face with her fabulous feast, of course) was the realization that sushi can be so much less work than I ever imagined possible. 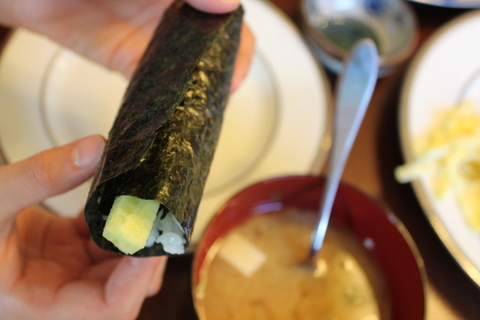 In the past, I have always rolled all the rolls myself, then sliced them in bite-size pieces before serving. Shirea serves sushi hand-roll style. Like a buffet burrito bar. She places all the ingredients on the table, everyone makes their own sushi rolls, and then, instead of slicing them, everyone just gobbles them up like burritos. Perfect. She highly recommended that I cook my rice in a rice cooker (and says even her relatives in Japan rely on them). I don’t have one, but I might look into getting one. The most interesting thing to me, though, was how she prepares and seasons the rice once it’s cooked. First, she dumps the hot rice into a large, wooden bowl, which helps to absorb the moisture. Then, she employs someone to fan the rice, blowing away the steam and helping cut down on moisture, as she stirs in the seasoned rice wine vinegar. She chided her husband, who played sous chef, for smashing the rice; the vinegar, she said, should be incorporated with a cutting motion, not stirred, which will make the rice smooshy. Special Diets & Allergies: Dairy free, wheat free, nut free. This can be made vegan or vegetarian if the fish and eggs are omitted. This is a laidback, easy-fix take on sushi with all the flavor and culinary pop you would expect from a great restaurant. The smoked salmon is magnificent against the sticky rice, crisp cucumber, creamy avocado, salty nori, and, of course, wicked-hot wasabi. Serve this with miso soup for a low-key meal that’s fit for a samurai. Combine the rice wine vinegar and sugar in a small bowl , and stir until the sugar is dissolved. Scoop the rice into a large, shallow bowl, preferably wood, while someone else fans the rice, blowing away the steam and cooling the grains. Pour the vinegar over the rice, incorporating the two with cutting motions. Avoid stirring or smashing the soft rice as you mix in the vinegar. Let sit while you prepare the other ingredients. Beat the eggs. Heat a small skillet over a burner on medium heat. Add the olive oil. 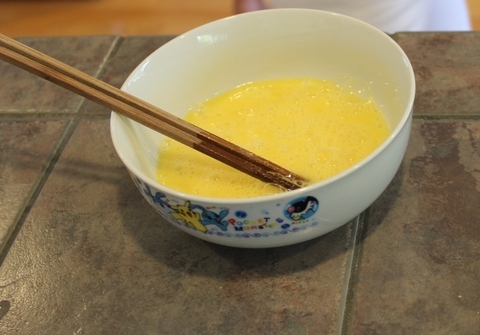 Pour a third of the eggs into the pan and swirl to thinly coat the pan. 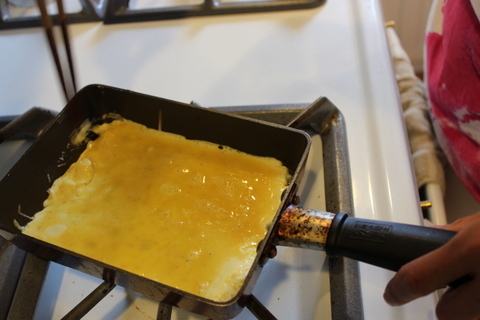 Once the eggs have cooked through, about 2 minutes, remove from the pan and set aside. Repeat two more times, until all the eggs are cooked. 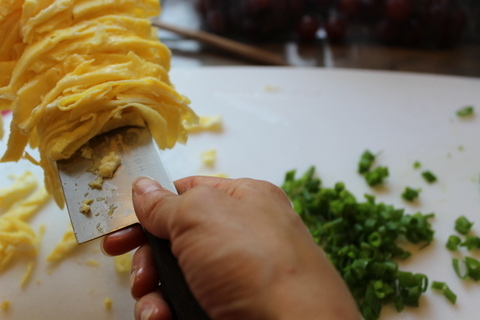 Thinly slice the cooked egg sheets into strips. Mix the salmon with the mayonnaise. Taste and add more mayonnaise, salt, and pepper to taste. Serve the ingredients buffet style and have diners assemble their own sushi: Take a piece of nori and place on your plate (or hand) rough side up. Spoon on 1/3 C or so of rice and spread out over the middle third of the nori. 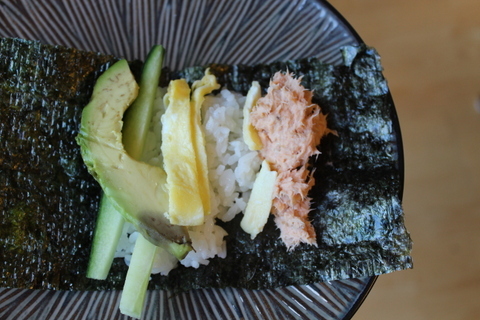 Place one or two avocado pieces, cucumber slices, and egg strips on the rice and top with a spoonful of the salmon mixture, then roll up like a burrito. 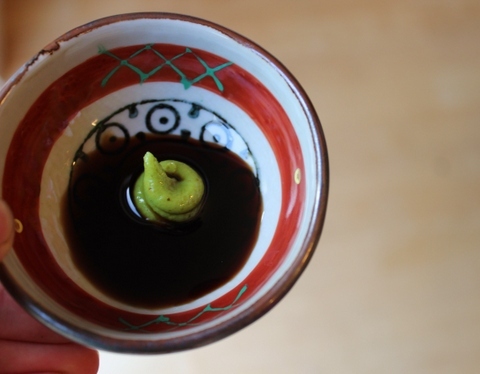 Give each guest a small plate to create their own dipping sauce of wasabi and soy sauce. (For those unfamiliar with wasabi, warn them to go easy at first—unless you don’t like them, then tell them to heap it on.) Dip the sushi roll in the sauce before each bite. Enjoy! Love this method. we do something similar after I struggled with rolling and cutting for everyone. Thanks for sharing – love your idea of macadamia nuts and carrots in sushi. This sounds and looks delicious! Love the instructional photographs.